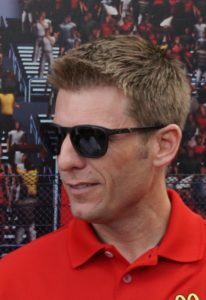 (NASCAR)—Joplin NASCAR driver Jamie McMurray has taken advantage of late-race crashes to pull off an 8th place finish on the Watkins Glen road course and gain valuable points in his effort to stay eligible for the Chase for the NASCAR Championship. McMurray’s seventh top-ten of the year, his third in the last five races, leaves him fifteenth in the standings, thirty points ahead of the last driver qualified to enter the Chase, teammate Kyle Larson, and 48 points ahead of Trevor Bayne, the first driver outside the top sixteen. The margin is an important one with only four races to go before the ten-race shootout for the championship begins. Sixteen drivers will be eligible to participate. Eleven drivers with wins automatically are in the hunt. A twelfth driver, last week’s Pocono winner, Chris Buescher, is still three points short of 30th in the standings. NASCAR rules say a driver with a win must finish in the top thirty in the standings to be Chase-eligible. Tony Stewart is in the field with a win and a 26th-place in the standings. If Buescher climbs into the top thirty, only four non-winners would fill out the 16-driver Chase field based on points. McMurray would be the fourth non-winner if the standings remain as they are. Columbian Carl Edwards started from the pole and led the first twenty-five laps on the 2.45-mile road course before a speeding penalty on his first pit stop put him at the back of the field. Pit strategy and good work put him up to second later, but he was involved in a four-car crash just past the halfway point that required time in the pits for repairs. Crashes that eliminated several cars helped him recover for a fifteen-place finish. NASCAR is off next weekend before resuming with a Saturday night race at Bristol on August 20th. (INDYCAR)—IndyCar has reached the three-quarters point in its season with Simon Pagenaud still in the points lead, a position he strengthened last weekend at Mid-Ohio when he won with closest challenger Will Power as runner-up. Pagenaud leads the standings by 58 points with only four races remaining. No other drivers appear to be in a contending position. Pagenaud is bidding to become the third French driver in Indianapolis champion car racing to win a national title. Gaston Chevrolet won the AAA national title in 1920. Sebastian Bourdais won four Champ Car titles, 2004-2007, during the time major open-wheel racing was split into two camps, Champ Car and the Indy Racing League. FORMULA 1)—Formula 1 is taking its summer break and will not race again until the Grand Prix of Belgium on August 28. The series has nine races left including the Grand Prix of the United States at the Circuit of the Americas near Austin, Texas on October 23.